The American continents have a very long and exciting history of using cold weapons. So, these knives, daggers, and even axes became a solid part of the folk costume for some countries of North and South America. Particularly, the traditional outfits of Native American Indians (who populated the territories of the modern US and Canada) and the national costumes of Argentina, Brazil, and Uruguay include the dress knives of various shapes and purposes. Let’s find out more about the mentioned dress knives. The previous article of this series can be found here: Dress knives as a part of national costume. Northern Europe. The Native American Indians used a lot of different weapons to survive. They were bows, spears, axes, knives, swords, bolas, darts, war clubs, etc. 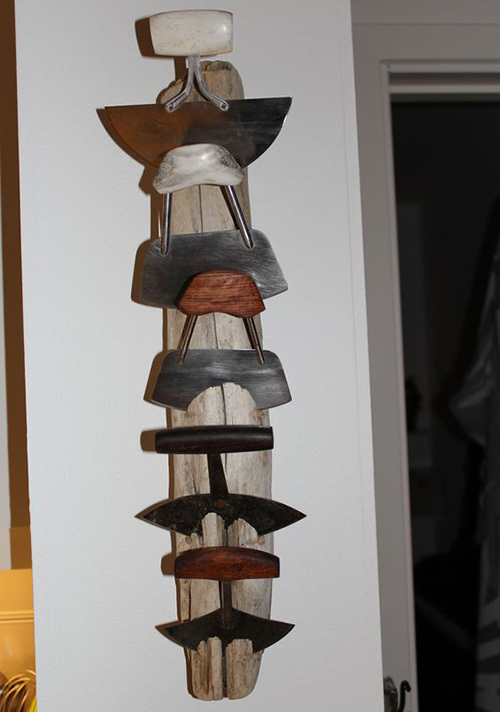 These pieces played an important role in the everyday life of the tribes. But only a few of them became the official part of the folk costume: for example, the traditional knife and the axe called “tomahawk”. The Native American dress knife has been a part of the traditional outfit for centuries. The Native American Indians always carried it with them. The knife itself can be made from various materials. The older items were made from a sharpened stone (flint, chert, or obsidian), a bone, or copper; modern knives are usually made of iron or steel. The handle can be made from wood, bone, horn, metal, and similar durable material. Some tribes from Alaska and Greenland traditionally use “ulu” knives made from ivory, bone, or copper. The shape of a ulu is different – semicircular blade is attached to a rectangular or oblong handle. The ulu knives are comfier for the daily household usage than for battles. The Native American dress knives usually are accomplished in a simple and handy shape, while the sheaths have an intricate and ornate design. They are often decorated with embroidery, beadwork, fringes, painted patterns, tassels, and so on and so forth. 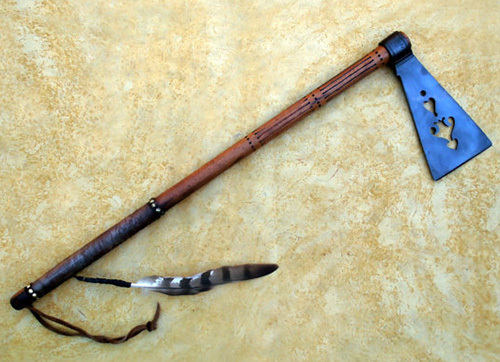 Another weapon used by the Native American Indians as a part of the traditional clothes is an axe called “tomahawk”. This item gained its popularity among the locals after the invasion of Europeans to the continent. The said Europeans brought iron and steel to the Indian tribes, so the axes became easier to make. The ancient tomahawks usually were carved from stone (sometimes it even was a monolithic piece of stone which formed the blade and the handle). Later, metal heads with wooden handles were used. Nowadays, it’s hard to imagine the national attire of a Native American Indian without a tomahawk as an important accessory. There were various shapes, purposes, and designs of axes used by the tribes. For example, ceremonial tomahawks – pipe tomahawks – weren’t used as a battle axe. The battle tomahawk could have a diverse design: small axes with short handles were thrown at the enemy; larger tomahawks, including two-handed ones, were used in a hand-to-hand combat. 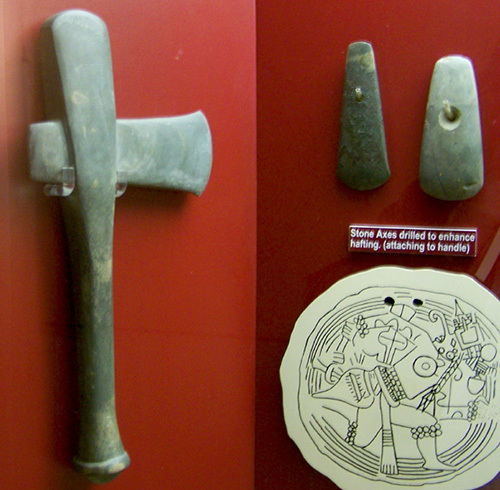 There were also axes that served as a tool or a household item. Sometimes, the heads of tomahawks were beautifully designed and embellished. For instance, the Missouri war axes had various patterns cut out in the metal of a blade. Similar to the dress knives of the Native American Indians, the tomahawks, that served as an accessory for the folk costume, usually had a decorated handle. The stone or metal head of the axe sometimes was as ornate, as the handle, but it also could be pretty simple. The handle was always embellished and festive – it could be covered with leather strips or pieces of fabric with a beadwork on it. The handle was also decorated with feathers, leather fringe, beads, pieces of fur, and any other decorations. The wooden handles could have metal adornments. The weapons used as a dress knife by the Native American Indians were fierce and beautifully embellished at the same time. Therefore, such accessories express the lifestyle of their owners best. You can tell a lot about the country and its population by the folk accessories, for example, the dress weapons. There are a few countries in South America that have a centuries-old tradition of carrying cold weapons that transformed into the official dress knives. 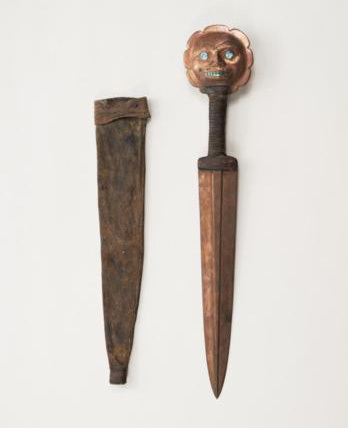 At first, these daggers and knives were used against enemies, for hunting, and in the household. With time, these items became an important part of the national outfit. In particular, Uruguay, Argentina, and Brazil have the oldest and most complicated history connected with the dress knives and daggers. In these areas, the knives were traditionally used by the gauchos – free people, the cowboys of Latin America. The gauchos have several dark pages in the book of their history, but in modern days, they are famous for their survival skills and the way they can handle their cattle. One of the most useful and important skills of gauchos is the handling of a knife. These people successfully fought with long knives, skinned the hides, cut food for cooking, etc. – often, for all of these tasks they used the same knife. The most desirable gaucho knives had silver handles and sheath, or at least, were decorated with some silver or even gold adornments. Even the poorest of gauchos tried by any mean to get such a knife into their possession. Another typical feature of gaucho knives is the fixed blade – locals didn’t appreciate folding blades. And the blade itself usually was rather long. If to talk about the shape of the blade, it could be either single-edged or double-edged. There are 4 main types of gaucho knives: facón, daga, puñal, and cuchilla. They somewhat differ from each other. But all of the items are fine, solid knives, both handy and noble-looking. The facón is a longish knife mostly used as a weapon in fights. It has a single-edged blade (often, with a short double-edge near the tip) of 15-18 inches long. This knife was usually made from a broken sword or saber, or even some old tool. The distinctive features of a facón are the presence of a fuller and a double guard (S-shaped, U-shaped, or short crossguard). This knife is strong, comfy, and very practical in a battle. The daga is a dagger. It is very similar to the facón, but its blade is double-edged. The blade is long and slim. The handle is graceful and often adorned with carving. The handle can be made from wood, antler, or metal (including silver). The sheaths are also beautiful and slim; they are either leather or metal. The puñal is a knife similar to a Bowie. The blade is single-edged and spear pointed; its shape resembles a large butcher knife. The knife doesn’t have a guard because of the integrally forged bolster also called "button". The puñal’s blade also has a “rat tail” – a long steel pin which is hidden inside of the handle. This pin reinforces the handle itself and the whole construction of a knife. Often, there are identifying marks of a blacksmith on the upper (dull) edge of the blade. 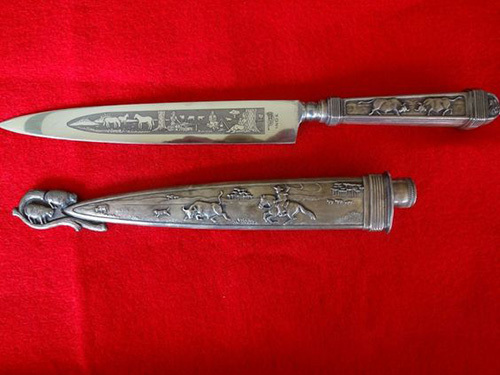 The puñals often are beautiful and ornate knives with carved silver or steel handles and elegant sheaths. The cuchilla is a utilitarian, and therefore very popular in Latin America kind of a knife. It resembles a puñal in shape but is much simpler, cheaper, and handier. The blade is single-edged, and the handle is made from wood or antler and attached to the tang with simple rivets. The most interesting and outstanding thing about this knife is the origin of its name – a “cuchilla” is a feminine noun; the shape of the blade is associated by the locals with a pregnant woman, so this knife is totally a “lady” among blades. South American gauchos were very handy with various knives. That’s why the knife even became a favorite and most useful accessory to the traditional costume of the local males. The men’s folk outfit often includes a dress knife or dagger as a part of the imago.